Market Forecast by: STB types (DTH, Cable and IPTV), STB Shipments and Regions. The report thoroughly covers the market by STBs types, by unit shipments and by regions. The report provides an unbiased and detailed analysis of the on-going market trends and market segments. The report also gives the insights on key market drivers and restraints and opportunities that shape the present and future market. Set top boxes which are prominently deployed in Indian market can be categorized into satellite STB, cable TV STB and IPTV STB. Satellite STBs leads the Indian market both in-terms of value and volume, however, in the coming years we will see major deployments in cable TV platform. 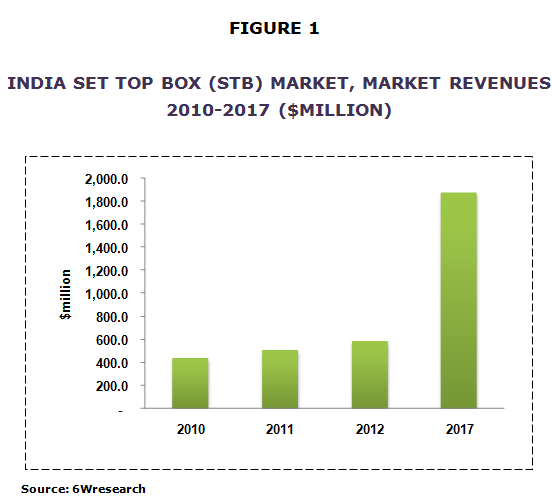 According to 6Wresearch, India set top box (STB) market is expected reach $1,877.5 million in 2017, at a CAGR of 26.0% from 2012-2017. The key or top players of Indian STB market are namely, Huawei, Pace, Cisco, Chang Hong, Skyworth, HUMAX, Technicolor, Echostar, MCBS, Indieon Technologies and Bharat Electronics.